Amravati which is one of the main districts of Maharashtra is a historically rich place. This district was an integral part of the East India Company following the treaty of 1853. The place is located in the central India with Amravati town being the administrative headquarter. Amravati is exactly located between 20°32' and 21°46' north latitudes and 76°37' and 78°27' east longitudes and is stretched over an area of 12,626 square kms. The district is on the Deccan plateau and is surrounded by Betul District of Madhya Pradesh to the north, Nagpur to the north-east, Wardha to the east, Yavatmal to the south, Washim to the southwest and Akola and Buldhana districts to the west. The district is divided administratively into 14 Talukas and 6 sub-divisions. The district headquarter is placed at an elevation of 343m (1125ft) above the sea level on the Maltekdi Hills and is at the cotton growing region of Maharashtra. Chhatri Talao & Wadali Talao are the two main lakes of the town and are considered to be two of the main water resources of Maharashtra. The Pohara & Chirodi hills are to the east of the town and popular tourist destinations. The district in general has a tropical wet and dry climate. One can face extreme weather variation throughout the year over here, with very hot summers and very cold winters. Onset of summer starts from March end and becomes unbearable during April and May, with temperature touching almost 47o C. Till June end the weather in this district is extremely hot and dry. With the advent of Monsoon in July, the temperature starts falling. 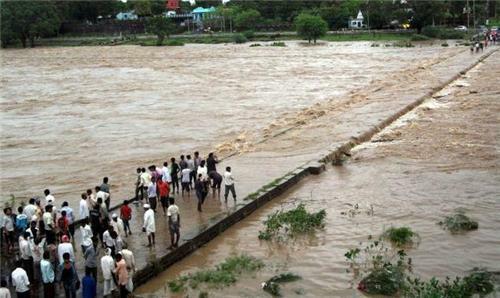 July to October is the Monsoon season, with south western monsoon bringing in heavy rainfall. During this time, temperature varies between 20oC to 37oC. July and August are the months during which the maximum rainfall occurs over here. Amravati district is considered to have the third highest rainfall in the entire Maharashtra state with approximately 1437mm of rainfall. Winter season is considered to be the best time to visit this place, with amazing cool weather. Tourists can enjoy winters during the range of November to March, with temperature ranging between 28oC to 5oC. This season is in general dry with very less rainfall occurring at times. 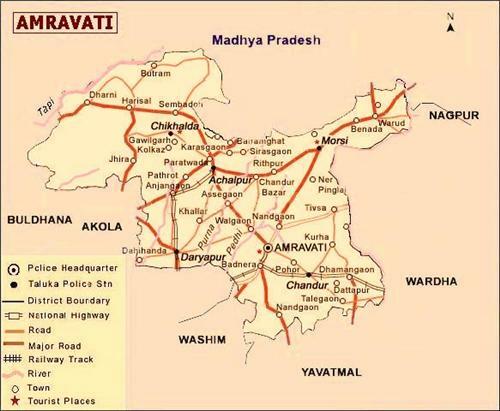 The Amravati district can be divided into two halves based on its soil types. The Meghlat Hill range having a deep black soil and the Paynghat plain area comprising of the deep brown and red soil (Regur). 75% of the total district falls under the Deccan trap, while only 25% area is considered to be very fertile. This area is comprised of the Purna and Wardha river alluvium and is suitable for various agricultural activities. The whole district is a mix of valley, hill and dense green forest. Chikhaldara and Dharni talukas fall in the dense forest of the Satrupa range with many teak and bamboo plantations. Chandur taluka is also under the hilly track and is famous for Tendu leaves plantation. Amravati district has a huge agricultural sector, belonging to small farming families to big agriculturalists with their own farm lands and production units. Since the district has both fertile and non fertile regions, the crops grown over these tracks are also different. Food grain cultivation occupies the largest area, of which Sorghum is the main cultivated crop. It occupies almost 50% of the total cultivable land. The farmers of the alluvium plain cultivate Wheat and Gram. The hilly tract of red soil bears various crops like Jawar, Toor, Moong, Sesame, Green Chickpea and Sugarcane. Amravati is also famous for different cash crop production. Cotton is considered to be the primary cash crop as the Regur soil is ideal for their farming. Amravati is contributing to the third highest Cotton farming in the entire Maharashtra state. Few of the other cash crops produced here are Orange, Groundnut, Soyabean, Chilli and Banana. This district is not a mineral rich place, with Sandstone found in some of the parts. Few of the major minerals found in this area are Fireclay, Murum, Stone, Sand and Clay. Amarvati district is covered by three major rivers namely, Tapi, Purna and Wardha. The Purna river flows through the southern slope of the Gavilgarh hills and marks the district boundary between Amravati and Akola. The main tributaries of Purna river helping in water distribution in the whole district are Pedhi, Arna, Chandrabhaga and the Shahnur. The Wardha river flows through the eastern boundary of the district with Tapi river flowing through the north western boundary. The district has a Dendritic Drainage Pattern (a tree-like trace of streams in a place that resulted from uniform surface control of the development of stream channels). This has helped the whole area with good agricultural output. Two main dams of the district helping in irrigation and water supply are the Shahanur dam on the Shahanur River and Chandrabhaga dam on River Chandrabhaga. For the tourists visiting this historically rich place, it is advisable to visit during the winter season. If plans are made for the summers, then light cotton clothes are advisable. One should protect his head from the heat by using cotton scarfs. Monsoon is good over here, but too much rain can spoil the travelling plans. Raincoat is a must during this season. Winters can be enjoyed thoroughly. Some heavy woollens should be carried as temperature can suddenly drop during the night time.